This is one of our most popular "long" Adventures that follow the ancient Silk Road from Turkey to China. To see if you qualify to take part in this Adventure and to make a reservation please write to us. Turkey, Georgia, (Armenia), Azerbaijan, Iran, Turkmenistan, Uzbekistan, Tajikistan, Kyrgyzstan, China. Round-trip shipment of your motorcycle from Seattle, Washington, USA to Istanbul, Turkey, and from Xian, China to Seattle. We can also assist with shipment from any place in the world. For pricing and additional information click Here. Southern Africa has so much to offer a adventure rider and we have put it all together in a 37 days journey. As always on any of GlobeRiders Adventures you will be riding your own bike while we take care of the logistics. Round-trip shipment of your motorcycle from Seattle, Washington, USA. In the year of 2000 GlobeRiders conducted the first long distance adventure by motorcycle. We had 14 bikes and 15 people ride from Tokyo, Japan, to Munchen, Germany. We are now working on a similar journey to celebrate the 20th anniversary of this journey and our companies adventures around the world. Space will be limited for this journey and previouse Globeriders will have priorety. We start the journey April 27th and finish on July 3rd to attend the BMW Motorrade Days in Garmish, just south of München, Germany. Shipping of your motorcycle from Seattle to Tokyo, Japan. Pricing and additional information will be announced at a later date. This will be our fifth time that we do this journey and every time we discover new sides to Africa. 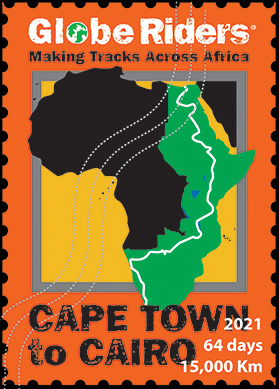 We will start the journey from Cape Town, South Africa January 20th 2019. South Africa, Namibia, Botswana, Zambia, Malawi, Tanzania, Kenya, Ethiopia, Sudan, Egypt. This Adventure to the Himalayas is our latest offering of tours and it one of the most diverse journeys you can ride your own bike. To learn more about the journey please take the time to check out some of our archived journals from previouse tours 2015, 2017 and 2018. China, Tibet, Nepal, India, Bhutan, Myanmar and Thailand. 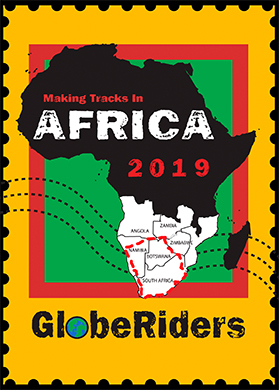 There are always Questions. . . .
GlobeRiders offers the most fascinating and challenging itineraries of any motorcycle tour operator on the planet . And, we go the extra distance to ship your motorcycle for every tour. At the end of the day, you can truly say "I did it on my own." We're delighted to see an increasingly international mix of participants on our tours and welcome riders from any country. In addition, your spouse, family members (18 and older), partner or friend are welcome to join in, either riding "pillion" with you, or as passengers in our chase/support vehicles. Unless required by local regulations, we don't do a "group ride". Every day, you have the option of riding solo, with friends new and old, or with our guides. We offer the experience of global touring in a supported environment. Our guidelines are few, and we will work with you to make every riding day exceed your expectations. Our adventure tours are for the rider/traveler who desires an experience few others will ever equal. We offer tours from 19 to 65 days in duration. We travel to over 27 countries that only a handful of riders have ever visited. Not just anyone may join our tours. You have to qualify. You must have the right experience, the right bike and the flexibility to deal with the unexpected. You'll need a GPS to ride with us. And along the way, we'll hold clinics and tech sessions to share all that we've learned with you. Our goal is to take you to places that few will ever see. To make it your experience, shipping your motorcycle for each tour’s departure is but one of the many personalized services we offer. Pre-tour, we create and moderate web-based forums where riders can ask questions, share knowledge and get to know one another before leaving home. We work with you to make you truly self-sufficient for the journey that lies ahead. Pre-departure, you'll receive a tour-specific RoadBook, a MapBook and a complete GPS datafile with waypoints, tracks, and the occasional route to guide you to each day's destination. Should a partner, family member or friend wish to participate, they may ride as a pillion passenger (two-up) with you on your bike, or on most tours, we will upgrade our chase vehicle so they may travel as a vehicle passenger, with the option to ride with you when it makes sense. Because it’s about far-away places and foreign cultures, we incorporate scenic attractions, cultural visits and selected activities along the way. For example, on our Africa Adventure, we fly you into the Okavango Delta for a multi-day safari by boat, canoe and 4x4. For every tour, we book the best available accommodations in advance, insuring a good night’s rest, allowing you to wake fully refreshed and ready to roll for the next day’s ride. We maintain a FAQ (Frequently Asked Questions) page that explains our tours and processes, and may answer question you didn't even know you had, to go there, please click here. On every adventure, we publish a Live!Journal, a weblog of photos and stories from staff and riders, all served up via email newsletter updates and a special section on our website. Come take a virtual tour with us and immerse yourself in an exotic adventure from the comfort of your own chair, just click here and we'll take you there. We are unique in producing a growing line of adventure and instructional DVDs. Short of being there, there's nothing better than a great movie, and learning how to equip and maintain your bike goes a long ways towards building your confidence as an adventure rider. To see our current DVD offerings, please click here. Come Ride the World with Us! We look forward to hearing from you and hope that you'll join us on a future GlobeRiders Adventure. Should you wish to make a reservation, or have any questions or comments, just click here.